City of Rhenish Prussia. Its Jewish community, which dates back to the eleventh century, is known for the series of persecutions and martyrdoms which it has experienced. When on May 30, 1096, the Crusaders made an attack on the Jews of Cologne, Archbishop Hermann III. led many of the latter to seven neighboring towns, one of which was Neuss, where they quietly remained till the end of June. On the 26th of that month, which was a holiday, the Crusaders, joined by a large mob, fell upon the Jews of Neuss (who, according to Albert of Aachen, numbered 200), massacred all of them, and plundered their houses. A certain Samuel b. Asher and his two sons were murdered on the bank of the Rhine after having been tortured, one of the sons (according to another report, both sons) being hanged on the door of his house. 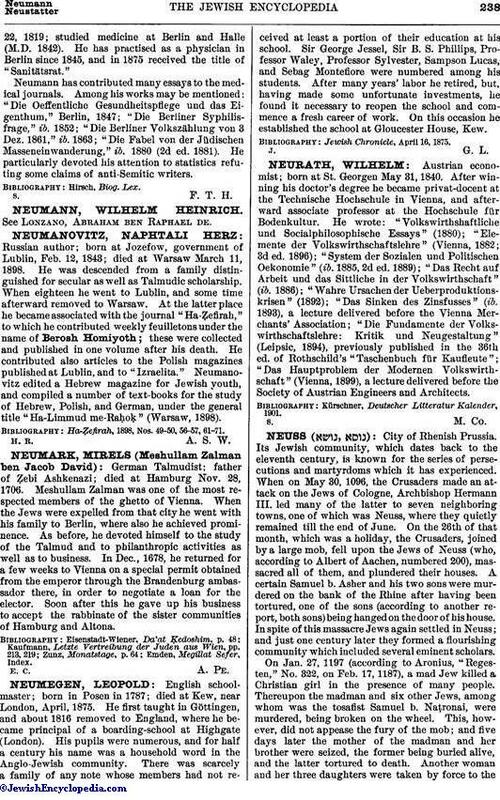 In spite of this massacre Jews again settled in Neuss; and just one century later they formed a flourishing community which included several eminent scholars. On Jan. 27, 1197 (according to Aronius, "Regesten," No. 322, on Feb. 17, 1187), a mad Jew killed a Christian girl in the presence of many people. Thereupon the madman and six other Jews, among whom was the tosafist Samuel b. Naṭronai, were murdered, being broken on the wheel. This, however, did not appease the fury of the mob; and five days later the mother of the madman and her brother were seized, the former being buried alive, and the latter tortured to death. Another woman and her three daughters were taken by force to thechurch and baptized. After the feast of Purim, however, they returned to their former faith. The Jews of Neuss bought for a large sum of money permission to bury the victims; they were besides required by Archbishop Adolf of Altenau to pay 150 pieces of silver. Ephraim b. Jacob of Bonn, who had been living at Neuss, had gone to Cologne just three days before these events. In the thirteenth century many Jews of Neuss emigrated to Cologne. In 1283 the Jews of Neuss, tired of oppression by Rudolph I. of Hapsburg, welcomed the usurper Frederick. They supported him with money to such an extent that he was styled "der Juden-König." He unfortunately met with a terrible end July 7, 1284, at the hand of Rudolph I. The Jewish community of Neuss was one of those that suffered in 1349 during the Black Death. 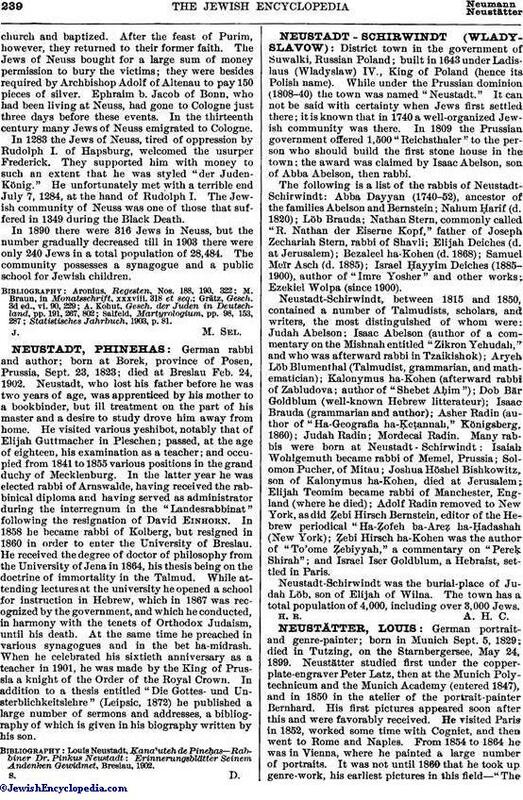 In 1890 there were 316 Jews in Neuss, but the number gradually decreased till in 1903 there were only 240 Jews in a total population of 28,484. The community possesses a synagogue and a public school for Jewish children. Statistisches Jahrbuch, 1903, p. 81.